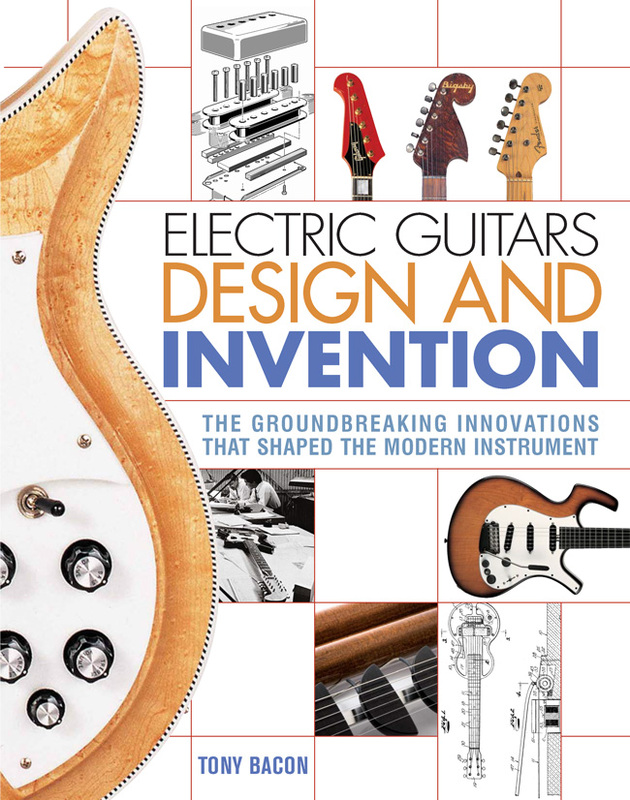 Editor's Note: This is an excerpt from Electric Guitars Design & Invention, a new book from acclaimed guitar author Tony Bacon. Tony has recently begun writing for Reverb, and we were thrilled to have the opportunity to share this passage. If you're interested in reading more great stories on truly landmark guitar designs, you can order the book here. 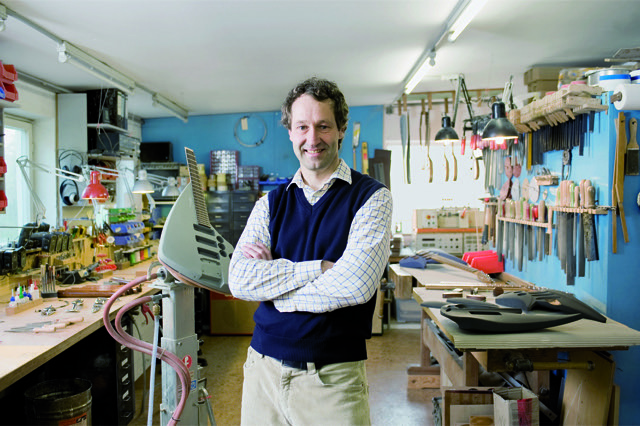 Ulrich Teuffel is a guitar maker based in Neu-Ulm in southern Germany, about halfway between Stuttgart and Munich. His best-known guitar design is the Birdfish, which he has built since 1995 among his other models. The Birdfish looks nothing like a regular instrument, with its skeletal plated-aluminium frame and two wooden bars instead of a conventional body, a headless maple neck, and interchangeable pickups. The "bird" and "fish" of the name are the two metal elements to which the twin body bars are screwed: the "bird" is the front section to which the neck is bolted; the "fish" is the rear section that holds the control pod; and a rail between the two holds the moveable pickups. Teuffel began making guitars as a hobby in the '80s, building flattops before he finished school, but switching to electrics because there was more demand. He turned professional in 1988, working at first with traditional methods. He took time out to study industrial design at the Karlsruhe University of Arts & Design and had the fortune to be taught by Hartmut Esslinger, the founder of Frog Design, who worked with Steve Jobs at Apple and was responsible for the "design language" of many of Apple’s '80s computers. "I think the most important thing that I learned from Esslinger was to think in concepts," Teuffel recalls today. "Once you start to come up with ideas, you have so many ideas on the table, like pieces from fifteen different puzzles. You have to find the right ones and connect them together. It’s the process of getting those things in order, and understanding which puzzle is the right one." Teuffel returned to guitar-making full of ideas. He knew that the new design he wanted to create, the one that became the Birdfish, would look shocking and be confrontational. "Otherwise," he says, "this guitar would already be there, on the market, and would not be shocking." He started by thinking of an electric guitar reduced to its functional elements: strings, body, controls, pickups, and so on. Then he began to make preliminary drawings and came to some early conclusions. One of the most radical concerned the body. He knew it would need to be to the side of the strings so that the pickups could be changed easily, and he deduced that it could be reduced to two long wooden bars. To arrive at his two-bar body design, Teuffel considered how early electric guitars had been designed. "There was no ancestor, no icon to follow, except the acoustic guitar," he says. 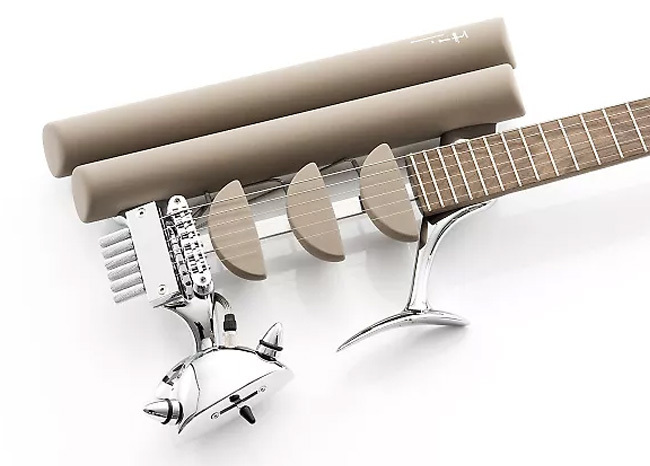 "The first designs were really closely connected to the look of acoustic guitars — the Les Pauls, all those early guitars. I think that was because the tone and the loudness of these new guitars was shocking enough, so it was a matter of, well, let’s not confuse people too much. We’ll use a design that they know about, the flattop shape. Then when we make it massive, the problem is that it gets heavy — so let’s make the body a little bit smaller. That was the problem in the beginning, that somehow makers were constrained by the images of existing guitars, of archetypal guitars." Teuffel was not constrained by those archetypes. He imagined the electric guitar anew. Not that he thought there was anything particularly wrong with the classic electric designs. "They sound as they sound, and they sound good enough, and of course now we have the context of all the musical content that has been created with exactly those instruments. Nevertheless, by not sticking to the archetypes, I became free to implement my ideas into my guitars, because I’m not constrained by the archetypal shapes and proportions." Teuffel developed the construction of the Birdfish over the years it has been in production – at the time of writing he had made 236, and the price was between 12,800 and 21,000 euros, depending on the type of plating and body wood. Today, he builds every single part of the instrument in his workshop. He now has a five-axis CNC machine so he can rout the aluminium parts, for instance. "It means something to me that I do it all in my workshop," Teuffel says, "that I don’t send out any more to get these parts manufactured. Doing it by my own hand enhances the quality, somehow, for me." His latest venture is to do his own electroplating. "I realised that if you do things by yourself, you can take care of every detail. I get much better results now — but it is ridiculous how much time it costs. I don’t look at the prices, because people want to have my guitars with the best results possible, and they pay for it. Philosophically, I like the idea of having crude material coming into my workshop, doing some magical things here, and then the end is the guitar coming out. I think the Birdfish is an instrument that takes everyone who plays it on a particular trip. Because it tells you how a guitar could be made."